In my work with several professors and teachers throughout the state on a course I entitled “Creating a Purposeful Life”, students are asked to ponder the idea of farming as a viable lifestyle option. As part of their homework, they are asked to approach their parents with two questions. 1. I am thinking about farming as a career option. What are your thoughts? 2. When I say the word “farmer”, what key words come to mind? The latter question is to be answered by both students and their parents. From the beginning, I noticed that many students were hesitant or simply afraid to approach their parents about this topic; the reactions from parents being mixed. Some showed support for their child’s interests, some conveyed feelings of concern and confusion, while some were excited to have their child try it out for a short time. One woman shared that she clearly hadn’t been praying for her son enough! Their disappointment and concern created similar feelings in me. While there is great appreciation for farming in this country, specifically as words like “local,” “organic,” and “non-GMO” are growing in national consciousness, how is it that our loved ones equate farming with such negative feelings and descriptions? How is it that the average age of farmers is in its upper fifties, with few following in their footsteps? “The Art of Farming” – changing the way they think about farming by viewing it as an art and not as a lifestyle of sacrifices and submissions. We can all relate to art in some form—where the content and practices are subjective to the individual—and there are certainly parallels with farming. Everyone will react differently to the product and the procedure, and perhaps by exposing people to the many aspects involved with farming, and allowing them to perceive it in a new light, it will feel more accessible and appealing. The art of farming is a balancing act—being able to manage 100 or more four-legged creatures while producing food for a fifty-member CSA and creating hand-woven apparel to sell at the farmer’s market is a skill that is learned and perfected. When done correctly, however, it can create a beautiful portrait of the people and the proud ownership of land and cultivation of earth. Farming is as much about producing a healthy community as it is about producing a healthy crop; providing a haven of food, friendship, and space for creativity and learning, with materials and knowledge on hand to spread the seeds of sustainability and healthy living to all. Nezinscot Farm is the perfect incubator for creating love and understanding of farming among younger generations. It is the first certified organic dairy in the state of Maine and is operated by two college-educated, third-generation farmers. Gregg and Gloria Varney have raised five children while also maintaining a successful farm store and cafe, where we sell our own grass-fed meats, cheeses, bread+baked goods, and canned goods. We have also created an extensive fiber studio featuring fiber and yarn from our own sheep, goats, alpacas, and rabbits. I am asking for your support to spread this knowledge of all the art forms practiced at Nezinscot Farm, whether it be in the fromagerie, boucherie, boulangerie, or fiber studio. 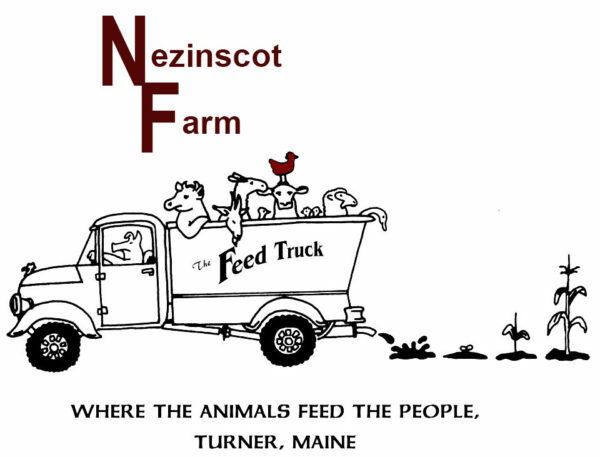 Nezinscot Farm is already working closely with both Bates College and the University of Maine at Farmington, as well as local school groups, in on-farm experiential learning programs. We would like to continue to extend our programs outwards to more students and schools. The program I have introduced, “Creating a Purposeful Life”, provides students and communities to be fully immersed in the day-to-day tasks required on a diversified organic dairy farm; In the hopes that it will serve as an inspiration for the painting of a new portrait, one of young farmers coming together in support of the important work that they are doing and the creation of a positive and fulfilling world. Coffee Shop: 6 a.m. – 5 p.m.
© Nezinscot Farm 2018. all rights reserved.